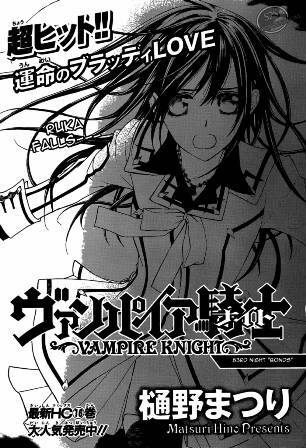 Vampire Knight 83 is up next and this will be an epic chapter. Vampire Knight chapter 83 release date will be around this week. Unfortunately raw scans or vampire knight 83 spoiler is not yet available. The next chapter will have 40 pages! UPDATE: Vampire Knight 83 is now available. It is entitled Bonds! You can read Vampire Knight 83 in popular manga sites online. A shocking event happened during the previous episode. Kaname and Zero are fighting furiously. Kaname delivers a powerful blow to Zero but Ruka jumped in to save and protect Zero. What could this mean? Because of Ruka’s intervention, Zero was saved. I’m guessing a lot of dramatic scenes will be revealed in the next chapter. It’s 40 pages. It might be combination of fighting scenes and “chit-chat” scenes. Vampire Knight 83 might be released sometime around 24th-27th day of this month. I’m not sure if I can get spoilers but I’ll post if I can find one. 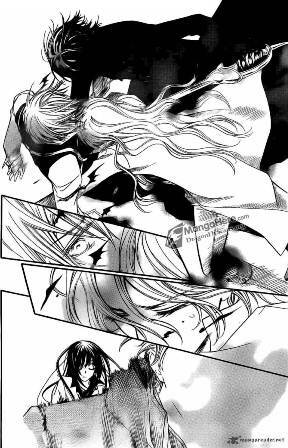 Vampire Knight Manga is a shoujo manga written by Matsuri Hino. The series premiered in the January 2005 issue of LaLa magazine and is still on-going. Chapters are collected and published in collected volumes by Hakusensha, with fifteen volumes currently released in Japan. The manga series is licensed in English by Viz Media, who has released fourteen volumes so far. Vampire Knight 82 Bloody Rose – Now Available!